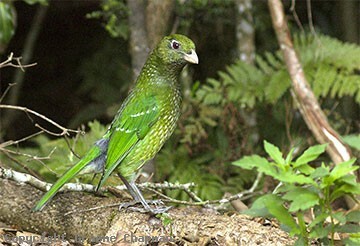 Green Catbirds are rainforest dwellers and occur down the east coast of Australia from near Rockhampton in Queensland south to Narooma in NSW. 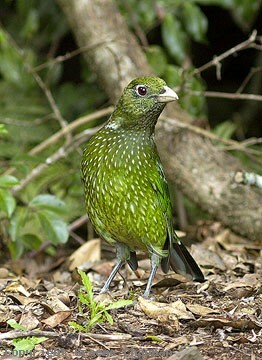 The closely related Spotted Catbird, sometimes regarded as the same species occurs further north in Queensland through to Cape York and New Guinea. 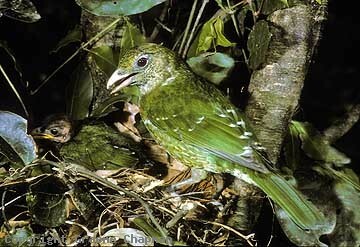 Related to the bowerbirds, they do not build bowers in the strict sense, but like the Toothbill, clear a rudimentary display area on the forest floor where they place upturned pale-green leaves. The name catbird refers to the sound of their peculiar loud calls, one of which can be likened to the phrase "here-I-are". (listen on sound page). Adults live as pairs in permanent territories where they feed mainly on rainforest fruits (especially figs) but they can be more omnivorous and consume invertebrates, frogs and even nestling birds occasionally. They build a substantial, bowl-shaped nest in thick vegetation up to about 20 m from the ground.Only the female incubates the eggs but both sexes feed the nestlings. 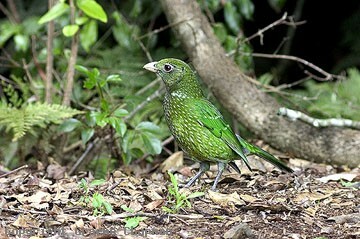 676201 ... Green Catbird, Mt Keira, N.S.W.